Four games, a win, a draw and two losses is the story of Dormaa Aduana Stars in this year's CAF Confederations Cup. The winners of Ghana's League last year picked up two goals from their net at Stade de Martyrs against AS Vita. With 2 group games to spare, Aduana lie 3rd on 4 points, averaging a point per game. Their bid to sail out of the group stage looks to have taken a nose dive with a trip to leaders Raja Casablanca in the coming. Coach Kenechi travelled with a 15 man squad for this crucial away game. Known to most fans, aside the 11 players who start the game, 3 substitutions are permitted. This means 14 players is what is required to see a game of football through. Normally, clubs announce a 16 or 18 man squad for battles. The Japanese trainer decided to be cost effective by travelling with just 15 players preferring to leave some names home. Did he pay the price? Sasraku Jr Still an Option? Sasraku has had his fair share of disciplinary problems and once again missed out of this tie due to the same problems. Aduana has lost Nat Asamoah midway through the season and with Sasraku suspended, Coach Kenechi doesn't seem to have many centre forwards. 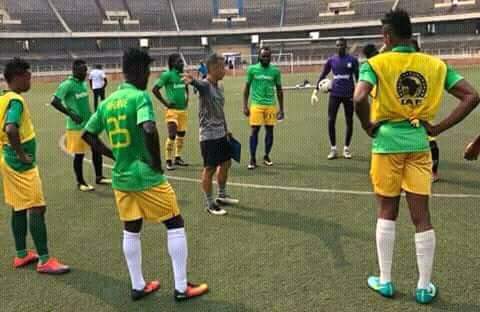 The transfer window is closed and one will expect the coaches to recall Sasraku to atleast see them through the next two games relieving Yahaya and Agyei off the burden at times. Football in Ghana took an indefinite break and this seems to have a toll on the Ogya Boys. The club struggled to beat AS Vita after close to a month and half of inactivity. They looked jaded in DR Congo and expectedly lost to a quicker and match fit Vita side. Missing out on Elvis Opoku, the gaffer choose to partner Akuoku and Boateng in the middle of the pitch. Akuoku is a rugged man in defence but he looks too flat footed to play as a central midfielder. He tackled well and duely got booked on the 17th minute but he had to be substituted soon after for picking up an injury. Was he overpowered by the pace of the Congolese side's midfielders? Even when he was taken off, a winger in Zacharia Mumuni replaced him with Noah Martey a central midfielder on the bench. Joseph Addo Rocked by Captaincy Change? After a good game against the same Congolese club at Dormaa, Yahaya Mohammed was named as the new club Captain of Aduana Stars. The forward returnee was giving the nod with Goalie, Joseph Addo relieved off the role. 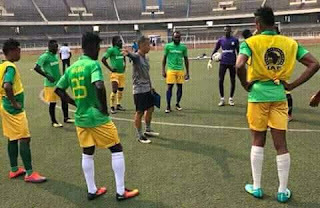 The goalkeeper conceeded two goals against Vita in DR Congo and another cheap one in Dormaa in the first encounter. Well, many have linked his captaincy loss to the two goals he conceeded but Addo has always been weak with serial situations. He conceding from a cross or freekick should be no stunner.